How To Make Almond Butter - Easy! 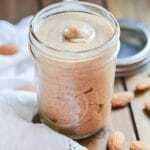 This is a quick and easy recipe how to make almond butter! Place raw almonds in a food processor. Turn the processor on and let the almonds blend for several minutes until reaches the desired consistency of almond butter. Takes about 10 minutes for creamy almond butter. Pinch of salt if desired. Optional: add a pinch of cinnamon or vanilla extract for additional flavor!